Well, this article is really just a preamble to a short trip I’ll be starting early tomorrow. Early, that is, if I manage to wake up, and don’t decide to waste time by polishing the cat before I leave. Luckily, I don’t have a cat. That’s lucky for the cat too. I don’t like cats. So, I’ll be heading pretty-much due south for what Google Maps says is a 240kms drive. I plan to follow that blue line shown to the right, but as always, I will be in the hands of Ms. Chuckles, my GPS lady, who may be a little rusty after a long lay off. In fact first I have to find her. Where the hell is she? Destination? 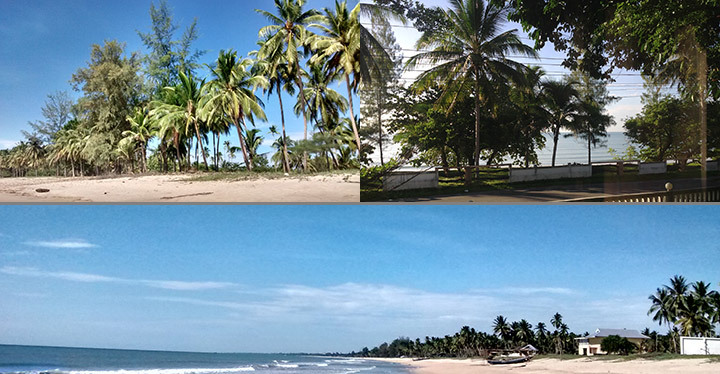 Songkhla. The city, in the Province of the same name, to the south of the lake of the same name. Why? To see what’s there, and report back. It looks interesting, and I have a list of about a dozen places to visit, but some of those will be dependent on the weather. We’ve been experiencing something called The Southwest Monsoon, but it seems to have moved north so I guess they’ll have to rename it. Actually the place has quite a chequered history. The area was originally (as in, early 1600s) known as the Sultanate of Singora (YSMV, your spelling may vary.) It was founded by a Persian Trader named Dato Mongol. Again, spellings vary, but you get the idea. He accepted the sovereignty of the King of Siam, who in those days was up in Ayutthaya, and he built himself a city and port which served the needs of a number of countries’ East India Companies, mostly exporting pepper. He declared himself to be the Sultan, and no doubt became very rich, upsetting the King in the process. In a nutshell, the King brought down 60,000 troops, the Sultan and his son built fortresses, and over a thirty year period the King’s troops eventually destroyed the place. Having reduced Singora to rubble, the King lost interest, offered to sell it to the French who also had no interest in a pile of rocks and bricks, and so the place slowly recovered into what today is a sleepy fishing town. Anyways; the forecast is good. I’ve given my Tibetan prayer wheel a few twizzles – the one I bought somewhere in the middle of nowhere in the northern mountains – so that should do the trick. Aside from Songkhla city, the journey looks good too. 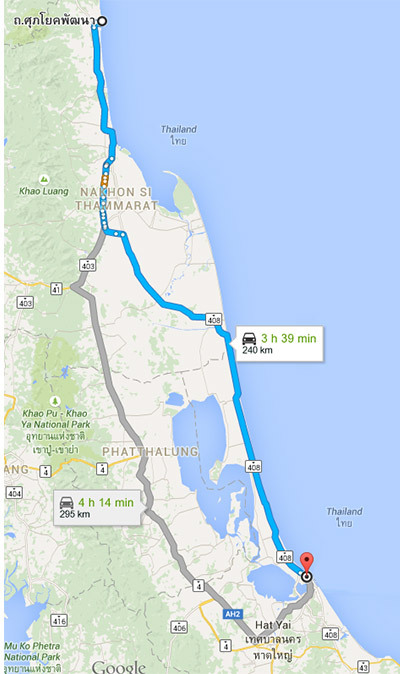 That blue line runs along the coast for the final part of the trip, with Lake Songkhla to my right. I might make a short detour. For the return journey I could follow that gray line. Ahhh, so many decisions. We’ll just have to wait and see. When I first thought about going, I figured I could do the whole trip in one day. Well, I could. But I wouldn’t see everything I want to see. So, I’ve booked a room for one night, and will extend that as needed. Or not. Sigh. More decisions. I don’t know much about the south. Most of my trips have been north, norther, and northest. So, this is kind of the start of some southern adventures. There’s plenty of places further south and southwest on my must-visit list. There’s a couple of Provinces I’ll probably avoid, due to ongoing “troubles” … or maybe I’ll zoom around them one day, take some photos, and zoom out again. Actually Songkhla does have occasional “troubles” so I’ll be packing my bomb-proof boxer shorts just in case. There’s a pun hiding in there somewhere … packing … just in case. Never mind. Anyhoo, grab yourself some lunch. I’ll be back with more news soon. This morning’s skyline looks monsoon-free. I’d like to order some more of that please.